Welcome to the official website of the Surrey Bowmen archery club. Surrey Bowmen (and women!) are based at the Old Paddock, Epsom Downs, Surrey, England. We are a small, friendly club, with a history that can be traced back as far as 1790. 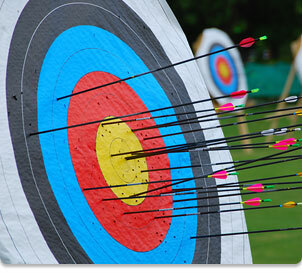 We meet regularly to participate in target archery, shooting recurve, compound and traditional longbow. Members range in age from 9 upwards, with skill levels from complete beginner through to the more 'experienced' archer! We are always pleased to welcome new members to the club. If you are interested in having a go at archery, then please contact us for information on our beginners courses. These are run from April to July for both children and adults. We can provide tuition and all the basic equipment you will need to have a go at this great sport! Beginners courses start from just £40. The Club takes safeguarding very seriously and has adopted the Archery GB Policy for Safeguarding Children and Vulnerable Adults, details of which may be found at www.archerygb.org. The club has a designated Safeguarding Officer who may be contacted if you have any queries or concerns; the Club's Safeguarding Code of Practice can be viewed here. In line with the General Data Protection Regulations our Privacy Notice can be found here. Surrey Bowmen meet on most Sunday mornings, typically arriving at the Old Paddock at 10.00 a.m. to start shooting at 10.30 a.m. Please see the fixture list for changes to this timetable, and also details of specific competitions and tournaments. Also shown are restrictions when we cannot shoot at the Old Paddock, due to horse racing on the Downs. Members of Surrey Bowmen or Atkins Archers are eligible to join our indoor group. This enables them to use the facilities of Gally Hill Shooting Club for indoor shooting. This facility, located in Banstead, is normally available on every Wednesday afternoon and evening throughout the year by arrangement with the keyholders. The clubroom above the shooting range offers full social facilities, including tea, coffee and a lounge environment to meet and chat. Non shooting visitors are also welcome at no charge.